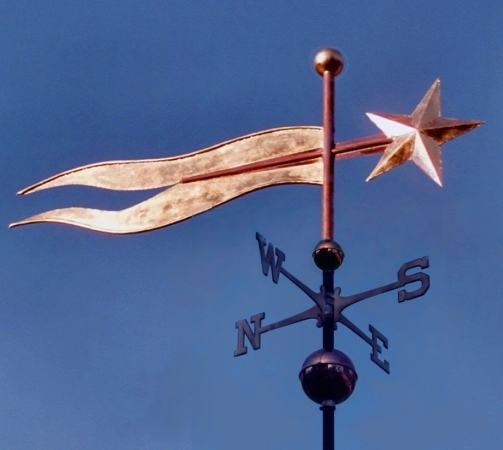 Banner Weathervanes are very effective visual pieces. 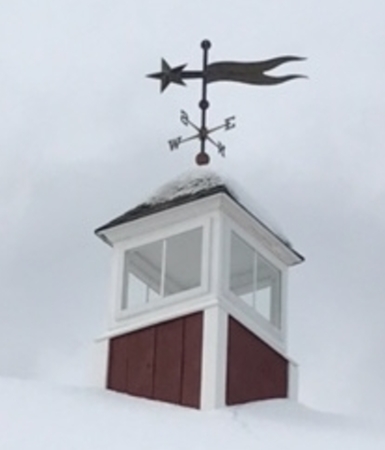 This Star and Banner Weathervane is especially nice. It takes to a variety of metals, and brightens with optional gilding. It could also have a company logo or family name gilded onto the streamers, making a bright statement against the copper of the sculpture piece. In the version pictured here the customer requested optional gold leaf on the upper ball, the star and the streamers. The base you see below this sculpture piece is a custom order. Please call if you would like a quote on this base, or some other unique design you might have in mind.